Magnús Pálsson is regarded as an master of intermedia art. In the early 80ths he was one of the first icelandic artists making connections to theatre, radio play and film. Together with Dieter Roth, Magnús Pálsson founded The Living Art Museum in Reykjavík. Inspired by the Fluxus art movement, it offered an alternative to the classic art museum. Magnús Pálsson exhibited at Documenta VI in Kassel in 1977, and represented Iceland at the Venice Biennale in 1980. His art is an art of the invisible; which occupies the imperceptible interstices between objects. His sculptures give form to the empty spaces using plasticized molds. His performances and installations opens up and enrich the meanings of human existence. The video “Clutch Disc” was made in 1998. The text coming from it is about melancholy in very ordinary life but really for anyone to understand in their own way. The recording was done on a blue background with Mágnus Pálsson sitting on a blue box. At the time this work told him something about the importance or unimportance of scale. The title has nothing to do with the video. It is more about the nature of titles. Sometimes they are descriptive of the work, sometimes symbolic. Here it is totally unrelated to the theme of the work – but still known by its silly aspect which is what Mágnus Pálsson wanted. A clutch disc is a part of a car engine and has to do with the changing of gears. Basic for the video is a series of little hand cut silver chairs. 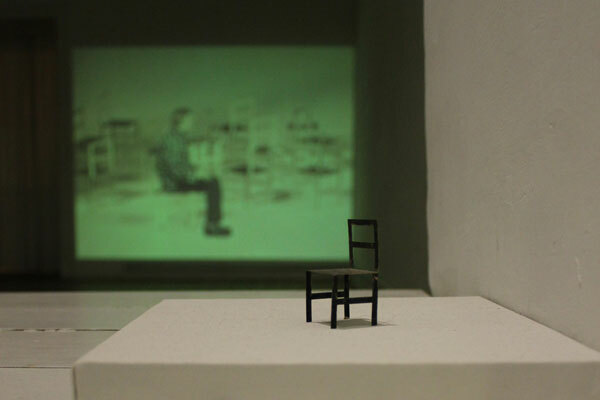 In the exhibition we´ll see one original chair from the series and the video projected in the gallery space. We are very happy to present this work of Mágnus Pálsson in a two week feature.